Excellent commentary by Phillip Wurm yet again! out of the pockets of hard-working, taxpaying Michigan parents." 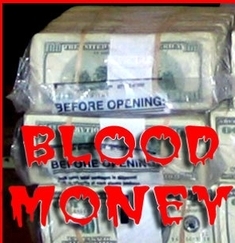 Make sure you read his "Blood Money" article as well. 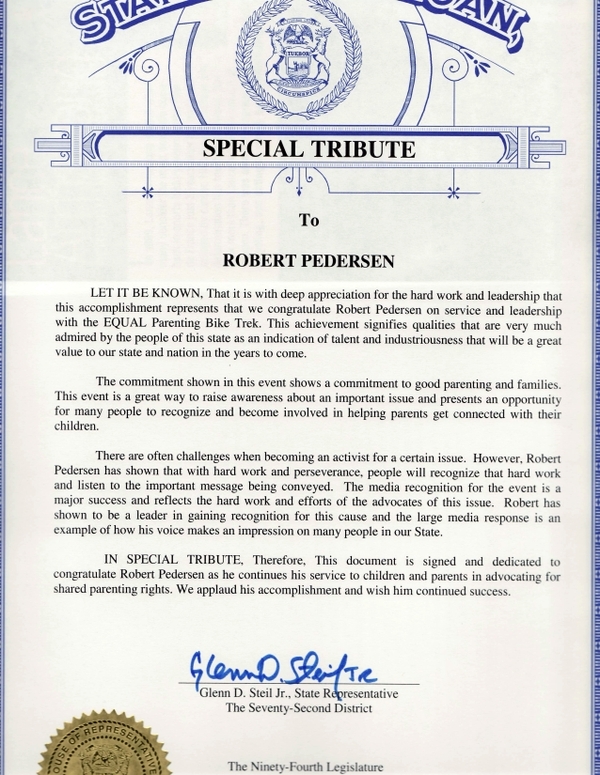 Robert Pedersen and Robb MacKenzie were honored with a State of Michigan Special Tribute for the 700 mile Equal Parenting Bike Trek from Lansing Michigan to Washington, D.C. This is simply incredible and truly an honor to receive this rare distinction from the State of Michigan. 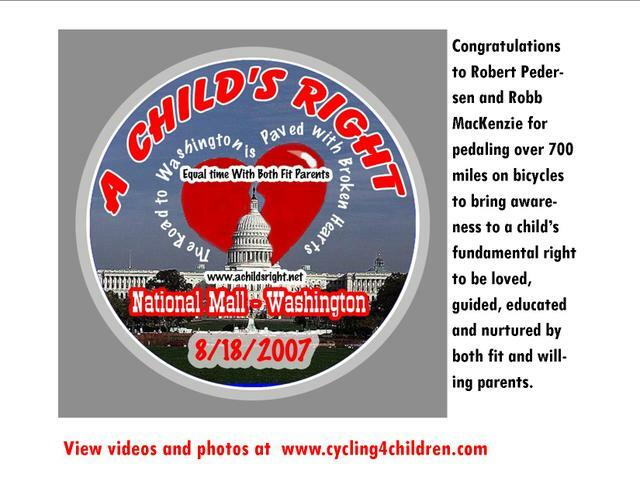 2007 has been an amazing year for the Equal Parenting Bike Trek. Wait till you see how big 2008 will be for the Equal Parenting Bike Trek and there are a few surprises already which we can't wait to leak out soon! Carol Rhodes, the famous author of the book "Friend of the Court Enemy of the Family", joins the media/supply van for the EQUAL Parenting Bike Trek!! Fantastic News!! I consider Carol to be a close friend and I am deeply touched by her committment to ensure the success of the EQUAL Parenting Bike Trek. My wife, Angela Pedersen, is also thrilled that Carol will be assisting her along the route from Lansing, MI to Washington, D.C. Carol and my wife will be helping to pass out literature, seek new media interviews along the route to D.C, discuss her unique perspective with the press and will help ensure the safety of Robb MacKenzie and I along our 700 mile bike trek. (Picture above - Robert Pedersen and Carol Rhodes). 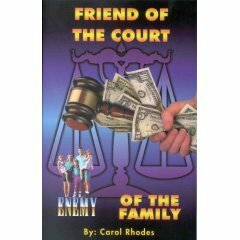 Listen to the shocking Carol Rhodes and Robert Pedersen interview on KRights Radio! 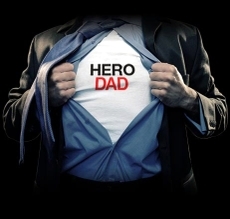 Teaser - Stay tuned - there has been a massive influx of media requests on Robert Pedersen's Hero Dad Contest win! Fantastic news everyone! More media requests keep coming in and Friday 06/22/07 Robert will be on one of Michigan's largest and most popular radio stations! Monday 06/25/07 Robert will be on yet another radio show stationed out of Iowa which has a national audience. Also, a very prominent Michigan newspaper will be completing a features article on Robert. They keep rolling in and as Robert's wife I am so proud of him for all of his dedication to Michigan's familes and children. Best Life Magazine's Hero Dad A big win for the entire state of Michigan! Robert Pedersen presenting at the Barry County Equal Parenting Symposium Video compliments of Lary Holland. This successful symposium was organized by Phil Wurm. 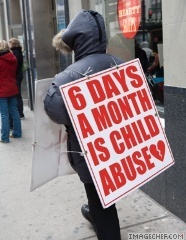 "Children who live absent their biological fathers are, on average, at least two to three times more likely to be poor, to use drugs, to experience educational, health, emotional and behavioral problems, to be victims of child abuse, and to engage in criminal behavior." Source: McLanahan, Sara L. "Life without Father: What happens to the children?" 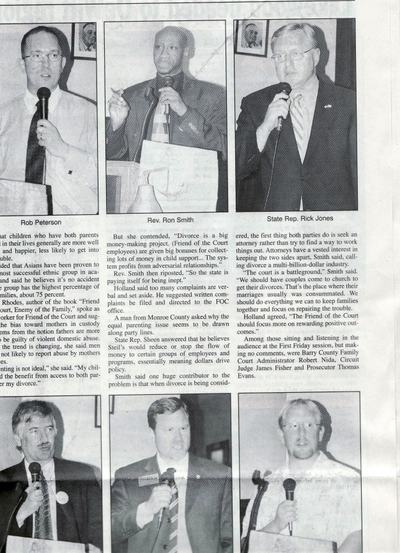 This is a quick Jpeg scan of part of the article that covered the EQUAL Parenting Symposium that Phil Wurm set up in Barry County. This made front page news!! Pictured in the article but not in this Jpeg scan was also Carol Rhodes and Representative Fulton Sheen. Of course, they spelled Robert Pedersen's last name wrong but we are used to that. This was a massive success thanks to our West Michigan Regional Director, Phillip Wurm!! He essentially organized this himself. The entire symposium was also covered by the TV media and we plan on obtaining our copy very soon! 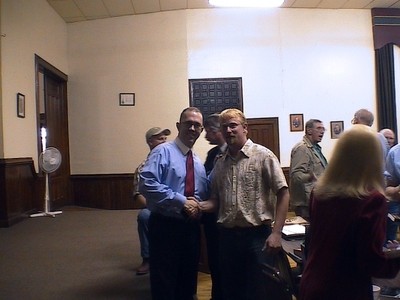 Three State Representatives attended this event and those in attendance were split down the middle by gender. Everyone was in strong support of shared parenting which was very exciting to see!! States Abducting Our Senior Citizens for Profit! 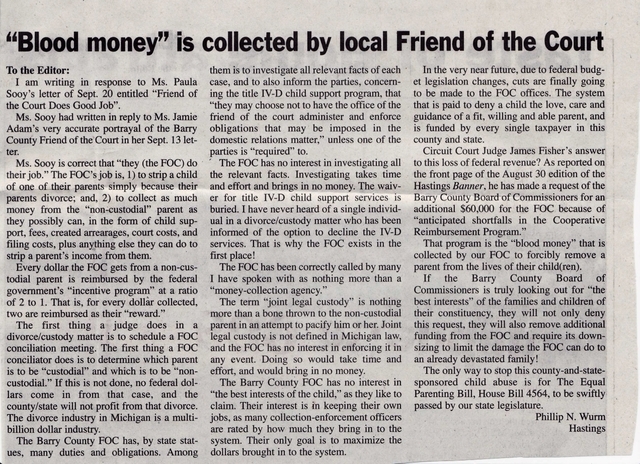 Barry County Michigan Equal Parenting Symposium Makes Front Page News! We received the excellent news that the Barry County Equal Parenting Symposium made the front page news in the local Barry County newspaper. 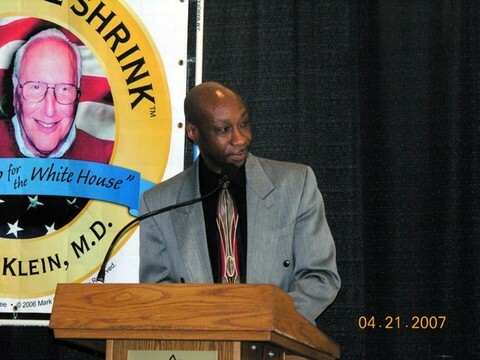 None of this success could have been possible without the hard work and preparation of A Child's Right West Michigan Regional Director, Phil Wurm. Phil essentially organized all of this and then chose the speakers panel. We will provide over the next several days plenty of video and picture footage compliments of Lary Holland. Below is an excellent video of Michigan State Representative Steil Jr. (Grand Rapids, MI) and the reasons why he supports shared parenting legislation such as HB 4564.